The hatrick ball reminded me of Akram's WC1992 heroics. This kid is special indeed. @lahoreqalandars falling apart in their innings with just four balls to go. Amir takes the first hat-trick of the PSL......!!! Amir gets the first ever PSL Hat-rick......!! Amir takes the first hat-trick of the PSL. OMG #KarachiKings are on Fire!!???????? Karachi and Peshawar have the strongest teams tbh. My finalists for the tournament. 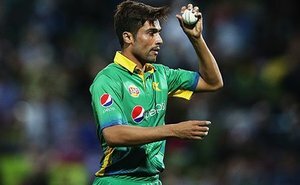 Hattrick by Muhammad Amir on his debut. WOW.
.@lahoreqalandars stumble to the lowest total of the #HBLPSL so far, but you can't count out the #DamaDamMast team just yet! Congratulations to @iamamirofficial for a first ever #HBLPSL hattrick!